We first heard about director David Karlak's Rise a few years ago when the filmmaker launched a Kickstarter for finishing funds on the short project â€“ an endeavour which was unsurprisingly successful. Karlak sold the movie to Warner Brothers a few years ago and though movement on the project has been slow, he's continue to plug away at this proof of concept short which makes a great case for a feature length movie. 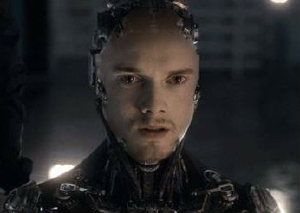 The short stars Anton Yelchin as the face of a robot leading a robot insurgency while Rufus Sewell plays a cop trying to stop the insurgency from happening. The basic premise is nothing new but Karlak's short doesn't only feature great actors giving great performances, it also boasts some spectacular visual effects. In addition to the short, the project has also seen life as a virtual reality experience. Built by Nurulize, audience members were able to walk through a photo-realistic set of the movie at the 2014 Tribeca Film Festival's Storyscapes exhibition. While there have been no more updates on the status of the project at WB, the short is generating some well deserved buzz and with any luck, we'll soon hear about Rise heading into production. Wow, pls forward any news as you get it. So, when's the short film coming out that was promised? Seriously, one of the best sci-fi shorts in recent memory.